Scientists tell us that climate change is upon us and the physical world is changing quickly with important implications for biodiversity and human well-being. Forests cover vast regions of the globe and serve as a first line of defense against the worst effects of climate change, but only if we keep them healthy and resilient. Forests in Our Changing World tells us how to do that. Authors Joe Landsberg and Richard Waring present an overview of forests around the globe, describing basic precepts of forest ecology and physiology and how forests will change as earth’s climate warms. Drawing on years of research and teaching, they discuss the values and uses of both natural and plantation-based forests. In easy-to-understand terms, they describe the ecosystem services forests provide, such as clean water and wildlife habitat, present economic concepts important to the management and policy decisions that affect forests, and introduce the use of growth-and-yield models and remote-sensing technology that provide the data behind those decisions. This book is a useful guide for undergraduates as well as managers, administrators, and policy makers in environmental organizations and government agencies looking for a clear overview of basic forest processes and pragmatic suggestions for protecting the health of forests. "Forests in Our Changing World provides an insight and sobering look at the status of our forests. Forestry professionals, land managers, naturalists, ecologists, and students of these subjects will appreciate this work." "In just seven chapters this readable book presents an overview of the whole gamut of forestry and forest-related activities today and looks to the future in a changing world." "The book offers much food for thought regarding the future of these ecosystems." "Forests in Our Changing World is a useful primer that will introduce students and the interested public to the field of forestry." 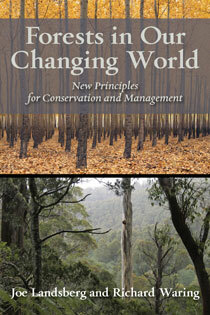 "A first-class introduction to current practices and emerging challenges in forestry." "Based on a deep knowledge of the physiology and ecology of forests, with a focus on the tensions between managing for their ecosystem service values and immediate economic values, this is an excellent, authoritative book on what is needed to maintain and use forests in a rapidly changing world." 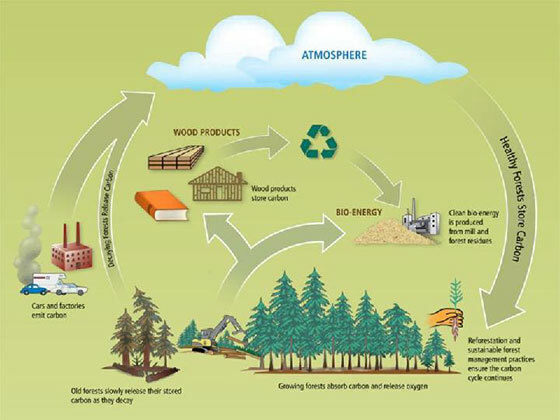 "Global forests provide wood, but also ecosystem services such as clean water, carbon storage, and biodiversity. Forests in Our Changing World explains the complex interactions between forests and their environment and highlights the risks of nonsustainable management." "Two experienced researchers and teachers bring together a deep understanding of how forests work and a sobering look at their status in a rapidly changing world. Landsberg and Waring combine history, science, and clear thinking about the future in a book that will be a valuable addition to introductory classes at the college level." -How Fast Is the Earth Warming? Download PowerPoint files for your course here (11mb zipped file). Most people now accept that the world’s climate is changing rapidly as a result of human activities — mainly the direct emissions of carbon dioxide and other gases that trap heat radiating from the earth, causing the temperature of our small blue planet to rise. This is leading to all sorts of political, economic and ecological problems. The effects of climate change caused by rising global temperatures are increasingly well documented, and we know what we need to do to slow the process (halting it is, unfortunately, impossible in the foreseeable future) enough to give us, and the world’s ecosystems, time to adapt to it. The actions needed involve difficult decisions and changes that will affect our social and economic systems. The whole business is made more difficult by the fact that there are people — and politicians seem to be well represented in this group — who do not accept the reality of climate change. Things are changing in this respect. Around the world there is widespread acceptance that climate change is real and serious, and of the fact that human activities are responsible for the speed at which it’s happening. However, we have just seen the election as (prospective) president of the United States, of a man who says climate change is a hoax, so it’s clear that the battle to convince as many people as possible of the reality and seriousness of the problem must go on. It seems that the best political outcome would be to persuade governments to tax carbon emissions. This would have all sorts of benefits for the economies of the countries that do it, as well as being the most effective measure anyone has thought of to check, and reduce, emissions while speeding the switch to more sustainable energy sources. The economic and ecological problems created by climate change include rising sea levels, more frequent and severe droughts, affecting food production in some parts of the world, and more frequent severe weather – storms, floods and heat waves. 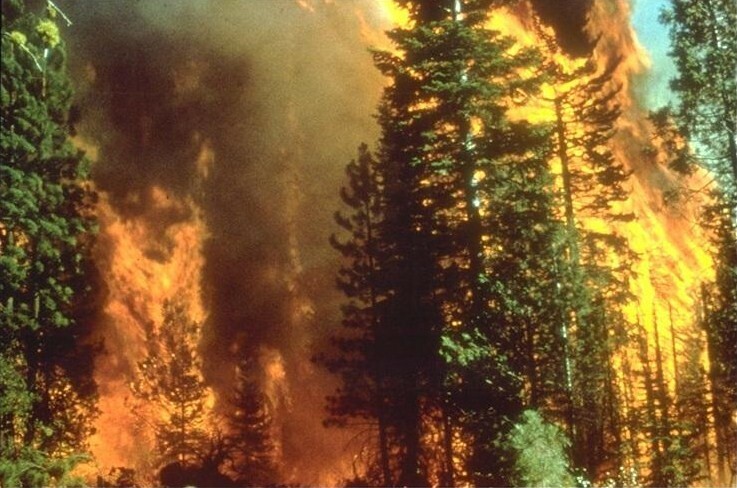 Natural ecosystems such as forests are subject to increasingly frequent disease and insect attacks as well as severe fires. But, besides being strongly affected by climate change, forests have an important role in mitigating it. Huge areas of lodgepole pine forests in British Columbia have been attacked and killed by mountain pine beetles as climatic conditions warm. Photo from Alex Woods, senior author “Forest health and climate change” A British Columbian perspective. Fig. 1 from The Forestry Chronicle 2010, Vol. 86, No. 4, pages 413-422. As scientists we have long been concerned with the general health and productivity of forests, with how to manage them to deal with the impacts of climate change and how forest management can help mitigate the problem. Forests are huge sponges (or sinks) for carbon dioxide. Trees grow by absorbing CO2 and using the sun’s energy to turn the gas into carbohydrates—wood. It has been estimated that forests fix, annually, about 60% of the emissions from fossil fuel burning and cement making — the latter a very large source of CO2. Young, actively-growing forests fix more CO2 than mature forests (although mature forests store more carbon). The bad news is that almost all the carbon fixed annually by forests is returned to the atmosphere by deforestation and burning. These statistics tell us that any management practice which increases (or just sustains) the growth rate of forests increases the amount of CO2 they take out of the atmosphere each year, while reducing deforestation rates will reduce the rate of accumulation of CO2 in the atmosphere. We mentioned earlier that climate change is making some forests more susceptible to disease and insect attack. Trees stressed by high temperatures and drought are less resistant to such attacks than healthy, unstressed trees. If a high proportion of the trees in a stand are killed, the stand becomes nothing more than a fire-storm waiting to happen. In the past year, across the western US, in Australia and Canada and Europe, these firestorms have happened quite frequently, with massive impacts on people and economies as well as regional ecosystems. 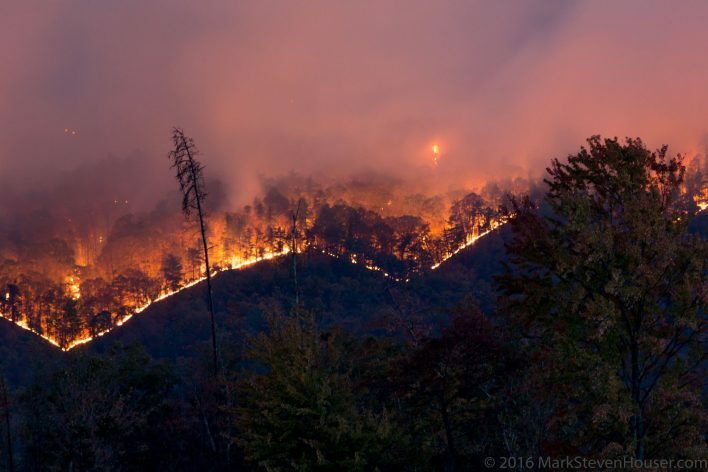 Forest fires in Western North Carolina, 2016. Photo by Houser Photography. We can’t do anything about the high temperatures and droughts in particular areas, but forest management practices such as thinning which, in effect, makes more of the water in the soil available to the remaining trees, help keep stands vigorous and healthy and more resistant to disease and insect attack. Prescribed ‘cool’ burns, carried out when the forests are not dry enough for the fires to explode into out-of-control wildfires, offer another approach. 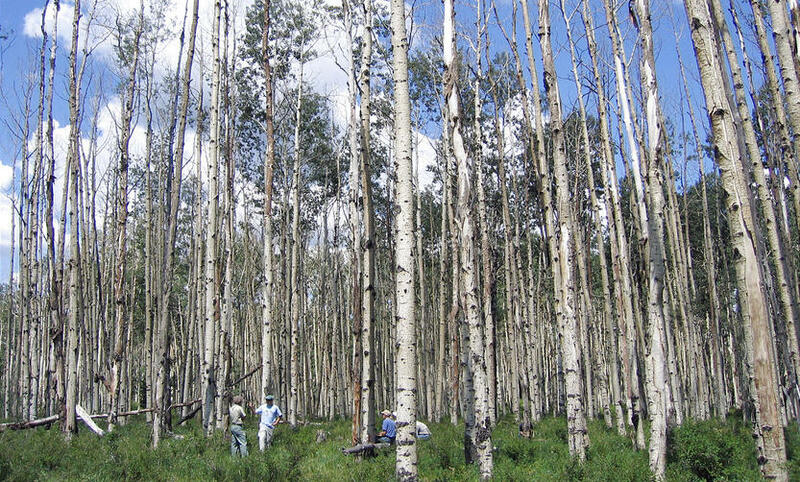 Heavily thinned stands of 120-year old lodgepole pine have increased tree resistance against mountain pine beetle attacks, even at epidemic levels. Photograph by R.H. Waring. Related blog here. 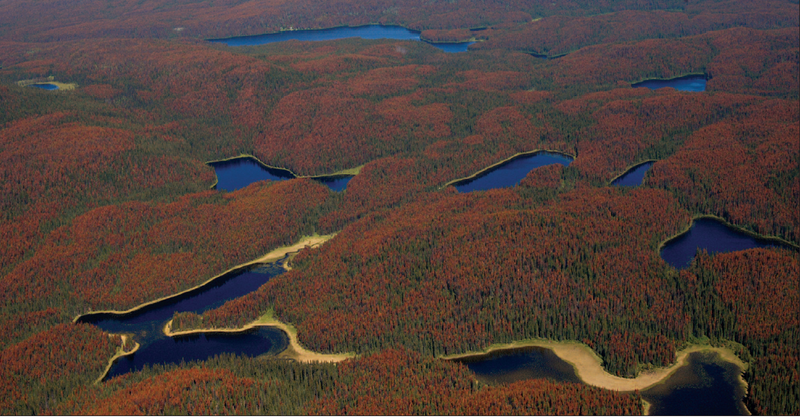 We have remote sensing tools, now, that allow us to monitor forests from space. We can detect and quantify the illegal logging, rampant in many parts of South America, in Indonesia and other Asian countries, and so bring pressure on those countries to curb the practice. We have developed models that use observations made by satellites, with weather data and information about soils, to predict forest growth and rates of carbon sequestration, by forests around the world. Models are also available that can predict when and where forests are most susceptible to fire, insects, and disease. We can use these, with data acquired from satellites, to assess the effectiveness of global management and plan how to improve it. Researchers have developed simulation models that keep track of water use by forests to predict when and where drought is sufficient to predict that large fires shall occur in western North America with an accuracy of 70%, verified from NASA satellite monitoring. Example for the year 2004. Waring &. Coops. 2016. Climatic Change 135:325–339. It may be that the battle against climate change cannot be won— at least, it seems unlikely that hopes for keeping average temperature changes to 2oC or less will be realized. That being the case, as well as continued efforts to restrain and reduce our carbon emissions, we have to learn to manage the situation in which the world finds itself. Resilience — the capacity to bounce back, to recover or to find a new acceptable route — has to be the operative word. For a resilient world we need very large areas of healthy forests. Joe Landsberg is a forest scientist and consultant with a long history of active international scientific collaboration studying the role of climate and weather on global forests. He is the coauthor with Richard Waring of Forests in Our Changing World. 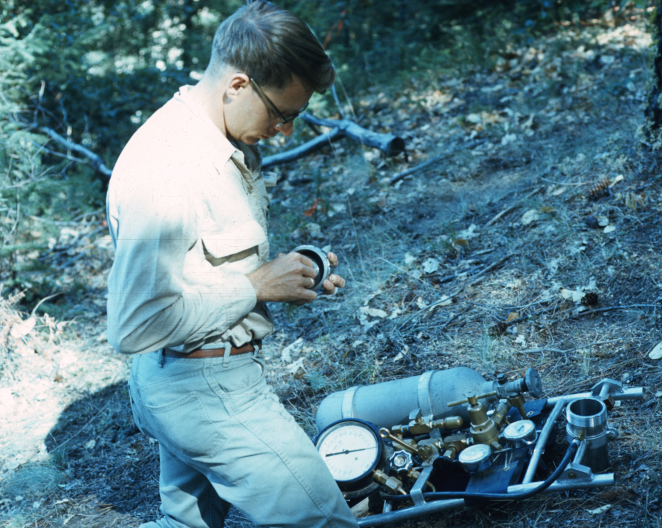 Richard Waring is emeritus Distinguished Professor of Forest Science at Oregon State University. He is the coauthor with Joe Landsberg of Forests in Our Changing World. For a long time we ecologists thought that we could predict not only how forests would grow but also how their composition was likely to change over time. And we could predict the effects of management actions: for example, If we chose to thin stands of trees in certain ways, we would expect predictable increases in the growth of the remaining trees, with more shrubs, grasses, and seedlings colonizing the gaps below the trees. But those old expectations no longer apply. Changes in climate are making the growth patterns of forests in particular areas different from those they followed in the past. And the changes mean that established forests are less well adapted to their home range than they used to be. As a case in point, the rate of climatic warming is so rapid that ponderosa pine trees on the Canadian border will need to sprout legs to enable them to move north 60 miles a decade to keep up with climatic conditions to which they are adapted. That’s not going to happen, with or without a climate change denier in the White House. 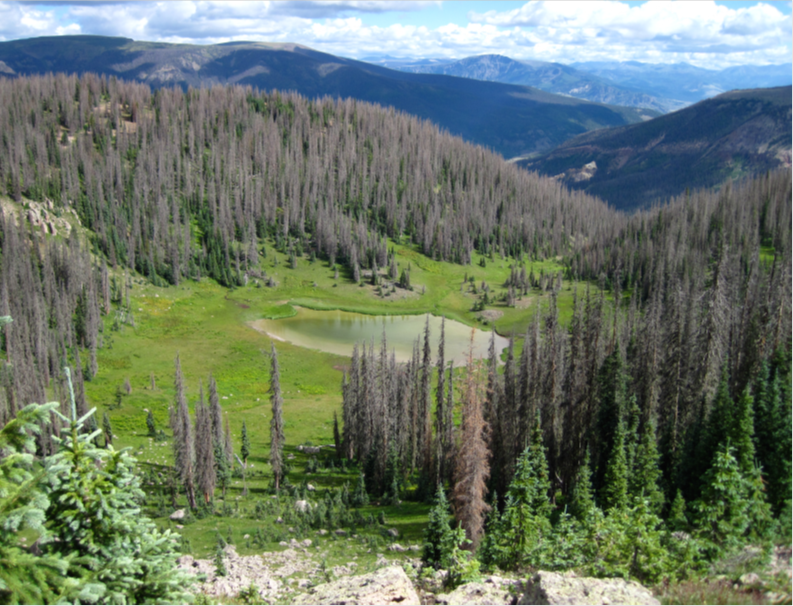 Another surprise is that, where we might expect warming to increase the growth rates of subalpine forests, these forests are dying as they have become more vulnerable to insect and disease outbreaks, as well as to wildfires. Subalpine forests are squeezed between the more temperate species encroaching from below and barriers of rocky, infertile soils, or no land at all to migrate to, at higher elevations. Even more shocking, large trees have become more susceptible to climate change where they were once more resilient than smaller trees with less developed root systems. What can we do to mitigate the effects of climate change on forests, besides planting different species in new places? One action would be to maintain a mix of tree species that exhibit a range of tolerances to climatic conditions as well as to insects and diseases. 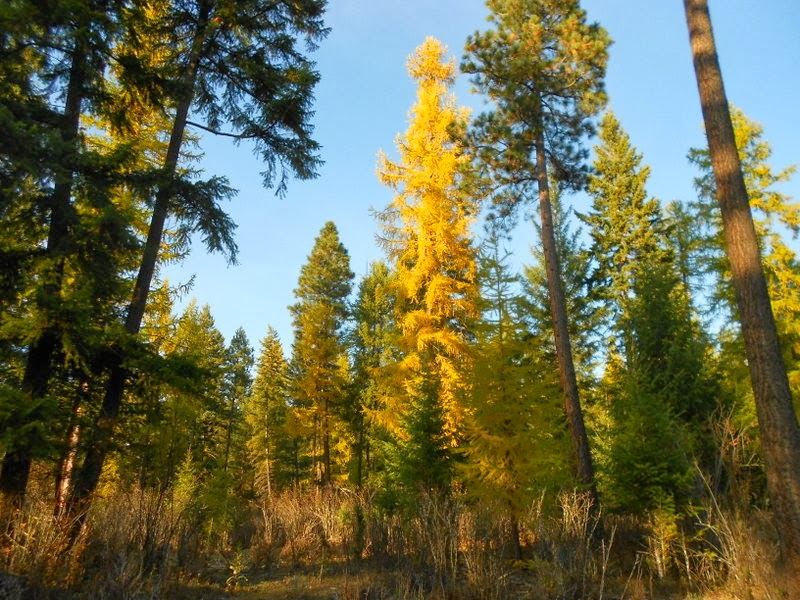 A forest composed of four or more different tree species (larch, Douglas-fir, ponderosa pine, and white fir) in Idaho has different tolerances to drought, fire, insect and disease. 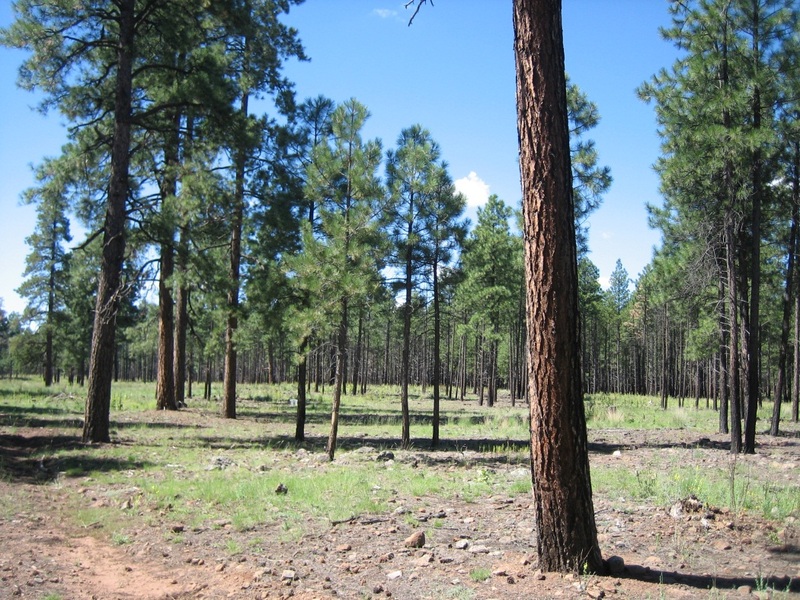 Alternatively, where only one species now dominates, as is the case in the ponderosa pine forests of southwestern United States, controlled fires can keep fuel from accumulating and reduce competition among the larger trees for water. 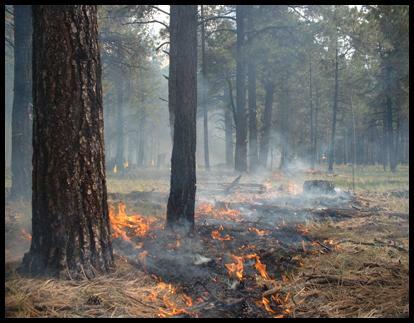 Intentionally set fires consume the thick layer of needles and kill smaller diameter trees when the fuel is moist. Photos credit: John Baily, Fire Ecologist, College of Forestry, Oregon State University. This leaves a stand of ponderosa pine resistant to wildfires if the practice is repeated at decadal intervals. Photo credit: John Baily, Fire Ecologist, College of Forestry, Oregon State University. Among the most valuable tools we have to pin-point where forests are thriving and where they are dying are nearly 60 years of satellite monitoring by NASA and NOAA government agencies. These records provide a way to separate intentional removal of trees from those killed by wildfires, disease and insects. They also provide the most efficient way to monitor carbon sequestration policies and to verify model predictions. Perhaps the greatest danger to the work of scientists studying climate change is the Trump administration’s stated goal of abolishing NASA entire Earth Science Division. That’s one threat every citizen interested in our future can do something about today to affect the world our children and grandchildren inherit. Do it! International Day of Forests was on Tuesday, March 21. While reflecting on the day, we asked Joe Landsberg and Richard Waring, authors of Forests in Our Changing World, if days like these have any meaning. Here's what they had to say: "Most specially designated days, beyond religious and memorialm days, have little meaning for the vast majority of people.We have arbor day in this country that involves the supervised action of planting trees. That probably makes an impression on kids, who, as they age, can return to see their plantings grow, and encourage their kids to appreciate urban trees, if nothing else." Forests in Our Changing World discusses how to keep forests healthy and resilient in the face of climate change. Check out the Introduction from the book below. Do you think days like International Day of Forests matter? Comment why or why not below. A new study from the Journal of Geophysical Research: Atmospheres suggests that naturally caused forest fires emit three times as much pollution as previously estimated. The pollution is in the form of particulate matter, which is one of the most dangerous forms of pollution. These measurements were compared to controlled forest fires intentionally set, and the findings showed that controlled fires produced less particulates. Richard Waring, Island Press author of Forests in our Changing World responded to the findings, saying: "The article that you provided the link to is sound, and no doubt representative of big 'campaign-type' fires in the western US and Canada where the dominant vegetation is primarily resinous conifers. I doubt the same amount of pollution would be generated by burning deciduous hardwood forests. Last year, my colleague Nicholas Coops and I published a paper focused on predicting wildfires in response to changing climatic conditions. In that publication, we recognized that the frequency of mega-fires is likely to increase as conditions continue to warm. The real solution is to cut pollution from burning fossil fuels, and to do so post-haste. 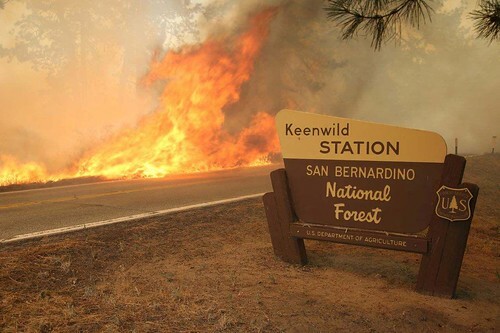 Pollution from forest fires is a feed-back response, not the cause of the problem." Most sane and sensible people accept the reality of human-induced climate change. Yet the Trump administration not only denies it, but is working to reduce actions that will help slow the process and mitigate its effects. The EPA, and other government-funded agencies are not even allowed to mention climate change. The contribution of trees and forests to the maintenance of a pleasant and livable global environment is well known and understood. However, as we know, forests around the world are under unprecedented pressure and are being destroyed at a horrifying rate. Clearance and illegal logging, particularly across southeast Asia, are rapidly reducing the area of tropical forests there. Brazil’s business-friendly government has recently proposed reducing the protected areas of the Amazon forests and has also announced plans to allow mining and development in protected areas. These activities will result in more clearance and forest degradation. The droughts that are becoming more common and severe in some parts of the world are affecting forests directly, and also increasing the likelihood that they will burn. Across the western US huge areas of coniferous forests, dried out by drought associated with the changing climate, have burned this summer. All indicators suggest that droughts will continue and fire frequency will increase, raising the possibility that many of those forests will be destroyed in the not-too-distant future. They will not be able to regenerate after repeated burning. In Portugal, Spain and France, the record heat of this summer, combined with drought, has resulted in unusual numbers of destructive forest fires, in which lives and property have been lost. Australia has just had an exceptionally warm, dry winter. Modelling and data analysis indicate that these conditions have been made 60 times more likely by climate change. The probability of damaging and destructive fires, always high in summer in Australia, has been significantly increased. So back to Trump and tree-planting. We know that this irrational, materialistic, bombastic and unreliable president is not likely to acknowledge the nature and causes of climate change, and is not likely to encourage or support programs aimed at saving existing forests and increasing the area of forested land on our beleaguered planet. But wouldn’t it be a splendid irony if reaction to Trump’s short-sighted stupidity led to an increase in tree planting that might otherwise be difficult to achieve? 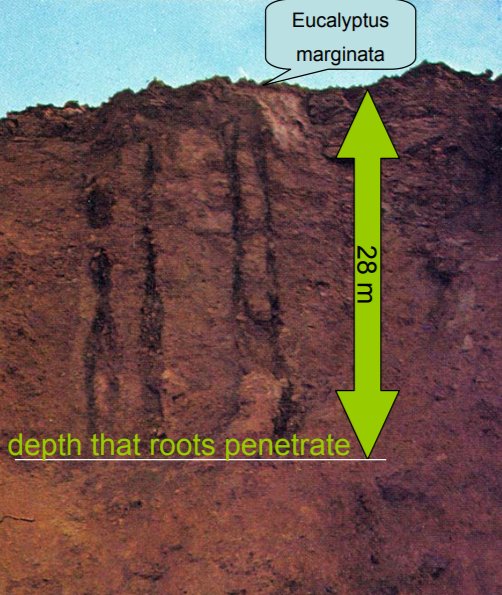 Unlike most annual crops, the roots of long-lived trees can penetrate through soils to great depth to reach water (Figure 1). If we can’t tell how deeply roots penetrate, how do we determine when trees run out of water? One way is to monitor the moisture status of leaves and twigs, because these are connected through the sapwood in branches, stems, and roots to water deep underground. Water in the tree’s conducting system is under tension; when a molecule evaporates from pores in the leaves, another molecule moves upward to maintain the integrity of the water column. The tension on the column during a typical clear day is often equivalent to a tension of 15 atmospheres (14.7 pounds per square inch) or more. At night, when dew accumulates on the foliage and there is no transpiration, the tension on the water column falls to as low at 1 atmosphere when water is readily available to the roots. Similar values would be recorded during a foggy day. As water is depleted from the soil, tension in tree’s vascular system increases, sometimes exceeding values of 40 atmospheres. Such high values result in breakage of the water column that can, if maintained for long, kill trees. Collecting twigs from tall trees at night is a dangerous job. 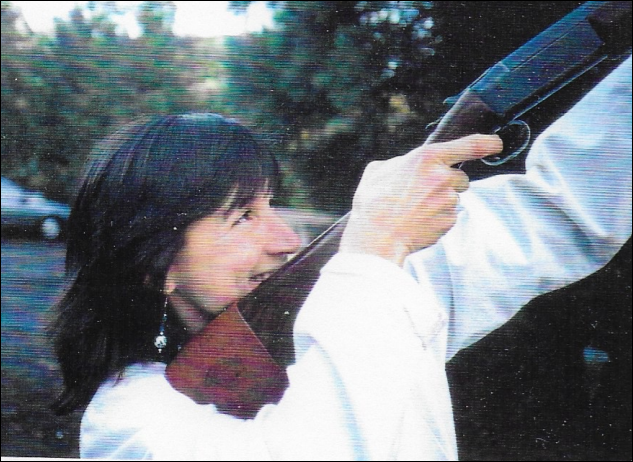 A shotgun loaded with buckshot is handy for sampling, although ones shoulder suffers (Fig. 2). Once a twig is severed, the tension is released on the water column. To determine how much tension the water column was under, the twig is inserted through a rubber stopper into a pressurized chamber, and the value recorded that is necessary to force water upward to the cut surface (Fig. 3). Before the effects of climate change became obvious, forest vegetation in arid parts of the western U.S. separated along defined water-stress gradient with native oak woodland at one extreme and subalpine forests at the other (Waring and Cleary 1967). Fig. 2. The smile soon disappears. Fig. 3. Severed twig being inserted into cap of a pressurized chamber. 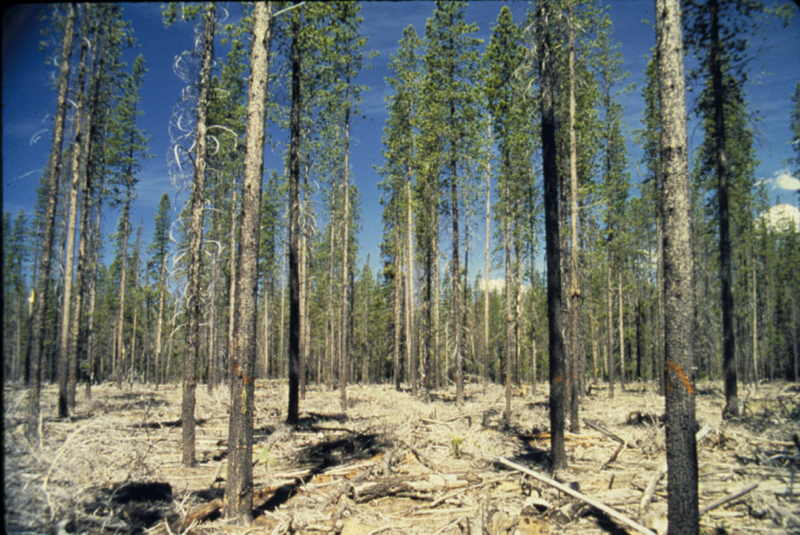 Since 2000, much of the forests in the western U.S. has experienced prolonged drought. Process-based forest growth models have been used to predict areas where trees might be expected to succumb to drought (Fig. 4) and aircraft carrying sophisticated remote sensing gear have confirmed the cumulative effects of sustained drought (Fig. 5). With the combination of modeling and ever-improving remote sensing tools, we have reached the stage where danger from wild fires can be predicted with increasing accuracy. The extent that damage from wildfires can be reduced by thinning stands of trees and through fuel reduction will soon be analyzed using these methods. Fig. 4. 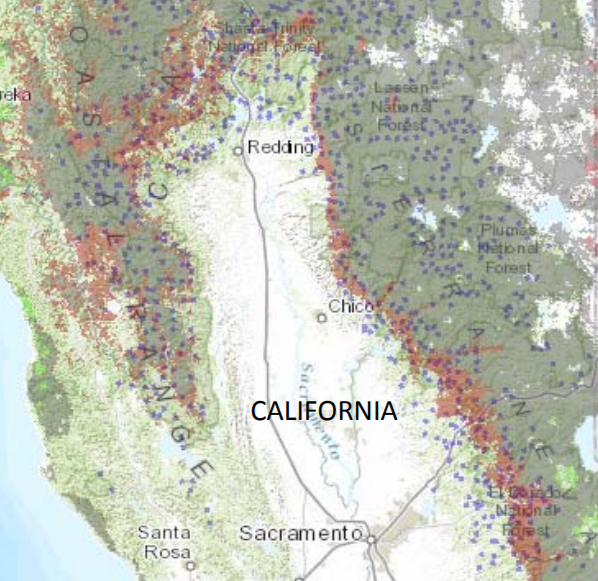 Areas in red indicates places in northern California where forests were predicted to be under sustained drought (Waring & Coops, 2016). Fig. 5. Airborne surveys with remote sensing instruments are able to validate (and improve) model predictions (Asner et al., 2015). Asner, G.P., P.G. Brodrick, C.B. Anderson, N. Vaughn, D.E. Knapp, and R.E. Martin. 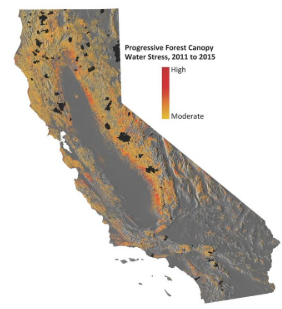 Progressive forest canopy water loss during the 2012-2015 California drought. Proc. Nat. Academy Sci. Dec. 28, 2015: E 249-E255. Waring, R.H., Coops, N.C. 2016. 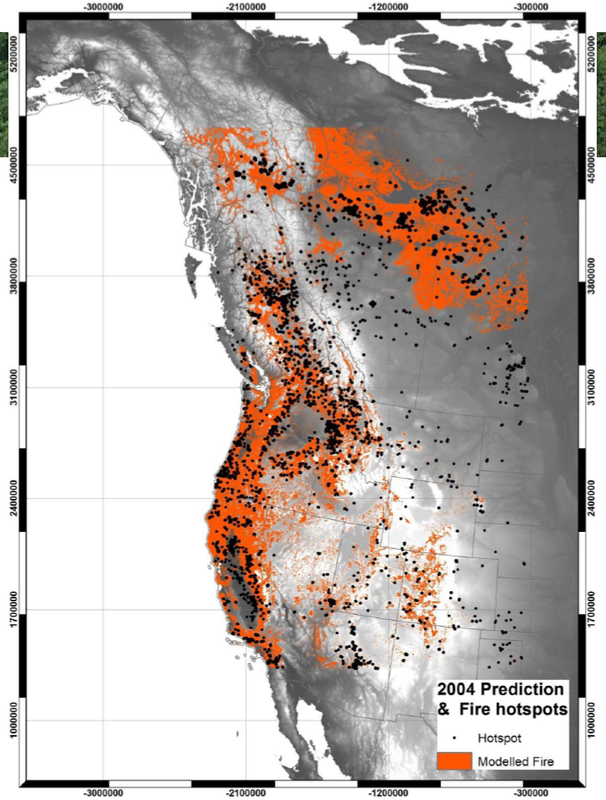 Predicting large wildfires across western North America by modeling seasonal variation in soil water balance. Climatic Change 135:325–339. Waring, R.H. and B.D. Cleary. 1967. Plant moisture stress: Evaluation by pressure bomb. Science 155:1248-1254.